My Rotten Stepbrother Ruined Cinderella by Jerry Mahoney is an interesting spin on a classic tale. When Maddie's stepbrother, Holden, breaks the unspoken rule among children and asks questions after Maddie's report on Cinderella, the two end up accidentally changing the story so that now one of the evil stepsisters ends up about to marry the Prince. Then when they read the story aloud, they get sucked into the story as a foot soldier and the other evil stepsister. Now it is up to them to fix the story and make Cinderella and the Prince fall in love. Can they fix the story, or will Maddie and Holden make it even worse. 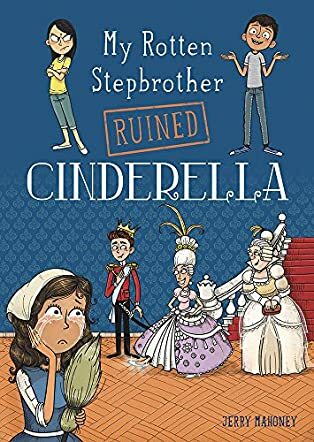 I really, really enjoyed reading My Rotten Stepbrother Ruined Cinderella by Jerry Mahoney. The book has some funny parts that will make the reader laugh aloud. I was hooked by the first page, and I did not want to put it down. The story is extremely well written and very descriptive. The plot is quite intriguing, and will keep the reader wanting to know what comes next. The characters are very likable, and show that anyone can change. The story is a really fun read and will delight both fans of the original story, and those who enjoy reading good books. This version brings up a lot of interesting points, and will change the way you see Cinderella. A fairy tale that will keep the reader captivated and wanting to find out more. I would definitely recommend this book to all readers.